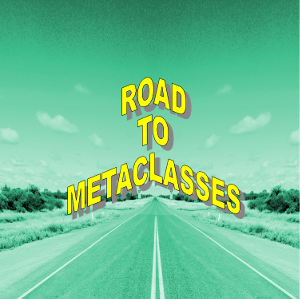 Metaclasses shouldn't be withtaken with Superclasses. We can see that we have multiple copies of the method "the_answer". This is error prone and tedious to maintain, of course. The way we have designed our classes, each Philosopher class will always have a method "the_answer". Let's assume, we don't know a priori if we want or need this method. Let's assume that the decision, if the classes have to be augmented, can only be made at runtime. This decision might depend on configuration files, user input or some calculations. Even though this is another solution to our problem, there are still some serious drawbacks. It's error-prone, because we have to add the same code to every class and it seems likely that we might forget it. Besides this it's getting hardly manageable and maybe even confusing, if there are many methods we want to add. We can improve our approach by defining a manager function and avoiding redundant code this way. The manager function will be used to augment the classes conditionally. This is again useful to solve our problem, but we, i.e. the class designers, must be careful not to forget to call the manager function "augment_answer". The code should be executed automatically. We need a way to make sure that "some" code might be executed automatically after the end of a class definition. Metaclasses can also be used for this purpose as we will learn in the next chapter.